4 - What Do We Know? 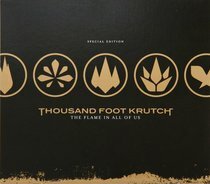 Thousand Foot Krutch is a Canadian alternative band formed in 1997,currently composed of Trevor McNevan (vocals), Steve Augustine (drums), Joel Bruyere (bass) and Ty Dietzler (touring guitarist), all of whom are Christians. McNevan and Augustine are also in FM Static; Joel Bruyere, has also started his own side project, entitled The Drawing Room; also McNevan has contributed guest vocals with Three Days Grace, Falling Up, KJ-52, Demon Hunter, Hawk Nelson and Manafest. Thousand Foot Krutch signed with Diamante and issued Set It Off, its official debut, in March 2001. The album featured a rap-rockified version of EMF's "Unbelievable," tricked out with a Christian-themed rap from McNevan. TFK jumped to the much higher profile Tooth & Nail for September 2003's Phenomenon. They'd grown up considerably in the two years since Set It Off, and the new album reflected a more focused, rocking sound. The trio joined Kutless and FM Static for a late-2003/early-2004 tour. 2005's The Art of Breaking adopted a more mainstream rock sound, which carried over to 2007's The Flame in All of Us as well. 2009's Welcome to the Masquerade, which would be the band's last release with Tooth & Nail, entered the Billboard Top 200 at number 35, peaking at number two on Christian rock radio. The group's sixth studio album, The End Is Where We Begin, arrived in 2012.